A few hundred years and the existence of Ford and Franklin ago, life existed without electricity, cars and iPhones. People washed their clothes in the river, they used horses to get around, and communication was done via post, or using actual speech. Somewhere along the line though, things were invented and life got easier. Technology brought the world into what it is today. But the reach of technology (and Apple) is still yet to touch some parts of the earth. Thank god it hasn’t yet got to Cabo Polonio. This small Uruguayan village is a cluster of tiny houses perched precariously on an outcrop of land jutting into the ocean, surrounded by a long stretch of golden-white beach. There is no electricity, no cars and no roads. The town is only accessible by a sandy track over the dunes, for which you can only walk or buy a ticket on the 4×4. There is one “restaurant”, and one “supermarket” (both would barely pass as a shed with a few picnic tables, and a very empty dairy, respectively, in the outside world). Our “hostel” did have a WiFi connection, but this was only a recent addition; an unwelcome foray into the 21st century for the needy tourists, the hostel operator laments. 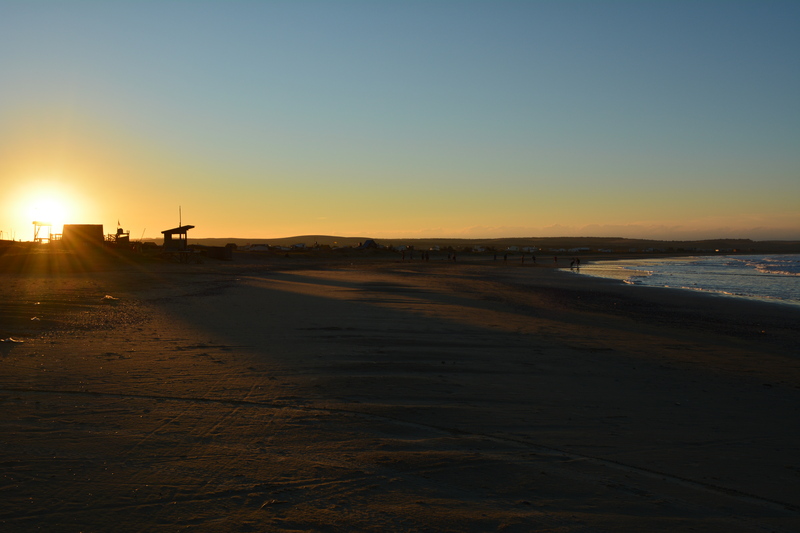 Due to an ATM fumble in the border town of Chuy that straddles Brazil and Uruguay, Michelle and I were left with less than $100 between us to cover all accommodation, transport and food until we got to the next biggest town on our itinerary – which was about 5 hours and 3 planned days down the coast. Needless to say, we chose the 8km walk into Cabo Polonio. Although we’d only chosen to struggle over the sand dunes with 15kg on our pack – because otherwise we wouldn’t eat for 72 hours – I’d actually recommend it. Aside from the long trudge through incredibly hard to manoeuvre sand, and the unnecessary fear of dying as we walked through about a kilometre of ominously spread out bulls, each of which stared menacingly in our direction – the view of the village as you round the final bend onto the beach is mesmerising. It’s hard to believe places like this still exist in the world. There is but one (maybe two, depending on how you classify your accommodations) “hostel” in the village open in low season that we quickly snapped up beds in upon arrival. For all intents and purposes, the aptly-named Hostel is essentially a squat fishing hut with maybe two and a half rooms, but it’s cosy – and unique for want of a better word. There was just one other couple there on the first night (more Kiwis, just reinforcing the argument of how overrepresented we are outside of our own country), reflecting with us on the ghost town-esque way the village operates during winter. Andres, our guitar-playing, merrily singing hostel operator tells us it’s not always this way – in summer the town swells to accommodate tens of thousands more people, and the hostels charge at least three times the price. We’ll take our $12, thanks. Though it might’ve been a little more comfortable with more than $4 in our pocket after accommodation and transport was paid, our first impression of the land where marijuana is legal (stinks everywhere. Lunch time, dinner time, 7.30am – not sure how anyone actually functions in that country) really could not have been better. Sunset on the roof of the hostel, a seal colony two hundred metres to the right, and morning runs along the beach in the morning (followed by aforementioned seals flapping around in the ocean, prompting many Little Mermaid fantasies), were particular highlights. 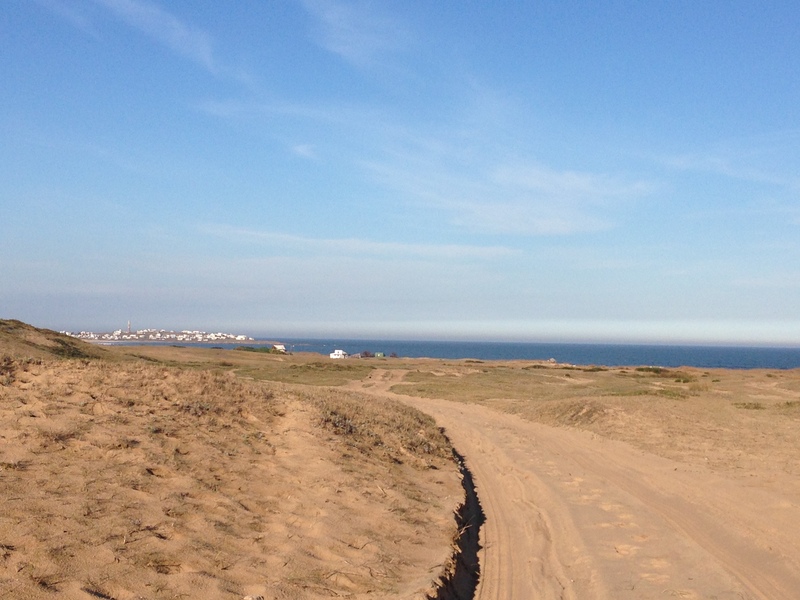 But perhaps the best aspect of Cabo Polonio, was getting away from the 21st century for a bit. For those two days, we went back in time. Dinner was caught by fossicking for mussels in the rocks (probably can’t align this solely with our vision to find nature and “live off the land” – $4 just doesn’t lend itself to affording much more than pasta and a tube of tomato puree) and nights were spent by the fire, joining in where we could with Andres on the guitar. And yet, the best was still yet to come. On our final day, as we were packing up and leaving – more devastated than we should be to be heading to a renowned beach resort and not back to the Victorian era or the likes – the hostel owner spontaneously offered us a ride back to the bus stop, saving us from our hefty packs, and the hefty bulls. Said elderly hostel owner definitely said the words ‘jeep’, but when it came time to board our trusty steed, ‘Jeep’ is not exactly what we found. Sure, by semantics it probably once was a Jeep. But what was once an intact 4-wheel drive, was now a shell of its former self. There was no back window – just a stretch of material, no petrol cap, just a wound up cloth to plug the hole, and exposed wiring at every turn. But the warning bells should really have sounded when he heaved our packs, unrestrained, onto the deck, opened the door for us and we noticed all that was left of the passenger seat was a small slab of foam. And then, first on the agenda was wiping spiderwebs from the windscreen and turning the key upwards of 15 times before the engine decided to turn over. Better yet, Michelle and I had to share the narrow foam slab. We were also told we’d probably have to dive out and walk if we were spotted, because tourists that don’t live in Cabo are strictly not allowed to take transport from anyone else – because the 4×4 company gets uppity with the locals scalping their business. Luckily, we won’t be recommending this as a mode of transport any time soon. For starters, it seems time may have eroded all suspension this trusty little guy ever had, because the drive back to town felt akin to sitting on a trampoline. Also, the driver’s door seemingly didn’t have a clasp, and repeatedly swung open mid-sand dune. Similarly, our door just didn’t close at all – so we were left holding it shut for dear life, but ending up caked in mud all the same. Lastly, on more than one occasion, smoke started billowing from beside my left thigh – a sight I expertly learned to ignore. The best part of the whole experience? When we made it back to the nearest town, we checked our pockets and realised we had close to $15 NZD left. Which could have bought us several things kinder to the palate than mussels and pasta, and cold mussels and pasta. Needless to say, we went directly to the nearest shop and spent it all on alfajores and ice-cream. Priorities.